Magu (Chinese: 麻姑; pinyin: Mágū; Wade–Giles: Ma-ku; literally: ‘Hemp Maiden’) is a legendary Taoist xian (仙 “immortal; transcendent”) associated with the elixir of life, and a symbolic protector of females in Chinese mythology. Stories in Chinese literature describe Magu as a beautiful young woman with long birdlike fingernails, while early myths associate her with caves. Magu xian shou (麻姑獻壽 “Magu gives her birthday greetings”) is a popular motif in Chinese art. The ancient bronze script for ma 麻 “cannabis” depicted plants hanging in a shed. Magu’s name compounds two common Chinese words: ma “cannabis; hemp” and gu “aunt; maid”. Ma (the modern Chinese character 麻, which derives from a Zhou Dynasty bronze script ideograph, shows 林 “plants” drying in a 广 “shed; shack”) originally meant “hemp, Cannabis sativa“. 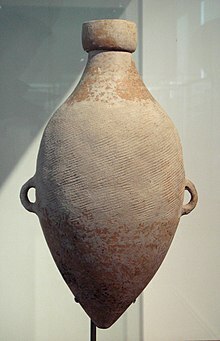 Cannabis has been continuously cultivated in China since Neolithic times (Li 1974:437); for example, hemp cords were used to create the characteristic line designs on Yangshao culture pottery and the fibres were used to produce cloth prior to the introduction of cotton. Ma has extended meanings of “numbed; tingling” (e.g., mazui 麻醉 “anesthetic; narcotic”), “pockmarked; pitted” (mazi 麻子 “hemp seed; pockmark”), “sesame” (zhima 芝麻), and an uncommon Chinese surname. Gu (姑, combining the 女 “woman” radical and a gu 古 “old” phonetic) is primarily used in female Chinese kinship terms for “father’s sister” (e.g., gugu 姑姑), “husband’s sister” (dagu 大姑 “elder sister-in-law”), and “husband’s mother” (wenggu 翁姑 “husband’s parents”). Gu can also mean “young woman, maiden, maid” (guniang 姑娘 “girl; daughter; prostitute”), and religious titles (daogu 道姑 “Daoist priestess”, nigu 尼姑 “Buddhist nun”). Translating Magu into English is problematic, depending upon whether her name is interpreted as a “maid”, “priestess”, or “goddess” of “hemp”, “marijuana”, or something else. Victor H. Mair (1990) proposed that Chinese wu (巫 “shaman”), pronounced *myag in Old Chinese, was a loanword from Old Persian *maguš “magician; magi”, which is hypothetically comparable with Magu. Chinese Magu (麻姑) is called Mago in Korean and Mako in Japanese. Mago (마고, 麻姑) is a cosmogonic goddess in Korean creation myths. Hwang (2004:1) calls her “the Great Goddess” and proposes “Magoism, the archaic gynocentric cultural matrix of East Asia, which derives from the worship of Mago as creatress, progenitress, and sovereign.” According to the Budoji, Korean mytho-history began with the “Era of Mago.” Japanese Mako (麻姑) is usually a literary reference to the Chinese story (below) about Magu’s long fingernails, for instance, Mako sōyō (麻姑掻痒 “Magu scratches the itch”) metaphorically means “things going like one imagined”. 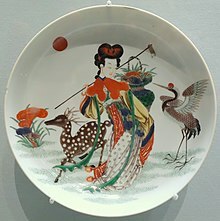 Porcelain dish with overglaze decoration depicting Magu, deity of longevity, Jingdezhen, Jiangxi province, Qing dynasty, c. 18th century, Asian Art Museum of San Francisco. 麻姑献寿 “Magu Presents Longevity”, late 19th-century mural in the Summer Palace‘s Long Corridor. Campany (2002:259-270) provides details of Magu mythology in his annotated translation of Ge Hong‘s Shenxian zhuan (神仙傳 “Biographies of Divine immortals”, ca. 317 CE). He compares four Chinese textual variations of Magu stories. (1) The Shenxian Zhuan Daoist hagiography of Wang Yuan (王遠, or Wang Fangping 王方平) and Magu has the longest early descriptions of her. Wang was supposedly a Confucianist scholar who quit his official post during the reign (146-168 CE) of Emperor Huan of Han and went into the mountains to become a Daoist xian. Later, while traveling in Wu (modern Zhejiang), Wang met Cai Jing 蔡經, whose physiognomy indicated he was destined to become an immortal, and taught him the basic techniques. After Cai had been gone for “over a decade”, he suddenly returned home, looking like a young man, announced that Lord Wang would visit on the “seventh day of the seventh month” (later associated with the Cowherd and Weaver Girl lovers’ festival), and ordered preparations for a feast. After Wang and his celestial entourage arrived on the auspicious “double-seven” day, he invited Magu to join their celebration because “It has been a long time since you were in the human realm.” She replied by invisible messenger. “Maid Ma bows and says: ‘Without our realizing it, more than five hundred years have passed since our last meeting! '” After apologizing that she would be delayed owing to an appointment at Penglai Mountain (a legendary island in the Eastern Sea, where the elixir of immortality grows), Ma arrived four hours later. She appeared to be a handsome woman of eighteen or nineteen; her hair was done up, and several loose strands hung down to her waist. Her gown had a pattern of colors, but it was not woven; it shimmered, dazzling the eyes, and was indescribable – it was not of this world. She approached and bowed to Wang, who bade her rise. When they were both seated, they called for the travelling canteen. The servings were piled up on gold platters and in jade cups without limit. There were rare delicacies, many of them made from flowers and fruits, and their fragrance permeated the air inside [Cai’s home] and out. When the meat was sliced and served, [in flavor] it resembled broiled mo, and was announced as kirin meat. 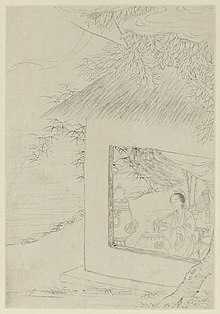 This “traveling canteen” is the xingchu (行廚), an exotic banquet that xian transcendents have the ability to summon at will. Magu legends frequently mention these mulberry fields in the East Sea (Christie 1968:50). When Magu was introduced to the women in Cai’s family, she transformed some rice into pearls as a trick to avoid the unclean influences of a recent childbirth. Then Wang presented Cai’s family with a strong liquor from “the celestial kitchens”, and warned that it was “unfit for drinking by ordinary people”. Even after diluting the liquor with water, everyone became intoxicated and wanted more. Some later versions of this legend say Ma was Wang’s sister. The poet Li Bai immortalized two Classical Chinese expressions from this story. Magu saobei (麻姑掻背 “Magu scratches [my] back”) refers to her extraordinary fingernails. Canghai sangtian (滄海桑田 “blue ocean [turns to] mulberry fields”) means “great changes over the course of time”; Joseph Needham (1959:599-600) says early Daoists observed seashells in mountainous rocks and recognized the vast scale of geologic transformations. (2) The Lieyi zhuan (列異傳 “Arrayed Marvels”, late 2nd or early 3rd century), attributed to Cao Pi (187-226 CE) has three stories about Wang Fangping. Kohn’s (1993:355-358, “The Hemp Lady”) translation includes a woodblock from the illustrated Zengxiang Liexian zhuan. (3) The Yiyuan (異苑 “Garden of Marvels”, early 5th century), by Liu Jingshu (劉敬叔), records a story about Meigu (梅姑 “Plum Maid”) or Magu, and suggests her cult originated during the Qin Dynasty (221-206 BCE). Campany reads this legend to describe founding a temple, probably on Lake Gongting, and translates these “shaman” and “shrine” references in the future tense. Compare the present tense translation of Miyakawa (1979:86) who interprets her body floating to an existing temple. Hellmut Wilhelm’s book review (1944:213) of Eberhard’s original German book (1943) suggested that Magu was associated with cannabis. Eberhard dismissed this hypothesis in the English version. Needham (1974:152) pointed out that Magu was goddess of Shandong‘s sacred Mount Tai, where cannabis “was supposed to be gathered on the seventh day of the seventh month, a day of seance banquets in the Taoist communities.” The (ca. 570 CE) Daoist encyclopedia Wushang Biyao 無上秘要 (“Supreme Secret Essentials”, Needham 1974:150) records that cannabis was added into ritual censers. Bretschneider, Emil. 1895. Botanicon Sinicum: Notes on Chinese Botany from Native and Western Sources. Part III, Botanical Investigations in the Materia Medica of the Ancient Chinese. Kelly & Walsh. Campany, Robert Ford. 2002. To Live As Long As Heaven and Earth: Ge Hong’s Traditions of Divine Transcendents. University of California Press. Eberhard, Wolfram. 1968. The Local Cultures of South and East China, Alide Eberhard, tr. Lokalkulturen im alten China, v. 2, 1943. E.J. Brill. Hahn, Thomas H. 2007. Bibliography of mountain-gazetteers 山志. Hwang, Hye Sook. 2004. An Investigation of Gynocentric Unity in Mago, the East Asian Great Goddess, and Elsewhere Presented at the Conference of Pacific and Southwest Women’s Studies, Scripps College, Claremont CA. Kohn, Livia. 1993. The Taoist Experience: An Anthology. State University of New York Press. Li, Hui-lin. 1974. “An archaeological and historical account of cannabis in China”, Economic Botany 28:437-47. Liu Ts’un-yan and Judith Berling. 1982. “The ‘Three Teachings’ in the Mongol-Yuan Period,” in Chan Hok-lam and Wm. Theodore de Bary, eds., Yuan Thought: Chinese Thought and Religion under the Mongols, 479-512, Columbia University Press. Mair, Victor H. 1990. “Old Sinitic *Myag, Old Persian Maguš and English Magician,” Early China 15: 27–47. Miyakawa Hisayuki. 1979. “Local Cults around Mount Lu at the Time of Sun En’s Rebellion,” in Facets of Taoism: Essays in Chinese Religion, Holmes Welch and Anna Seidel, eds., 83-102. New Haven: Yale University Press. Needham, Joseph. 1959. Science and Civilisation in China, Vol. 3, Mathematics and the Sciences of the Heavens and the Earth. Cambridge University Press. Needham, Joseph. 1974. Science and Civilisation in China: Volume 5, Chemistry and Chemical Technology; Part 2, Spagyrical Discovery and Invention: Magisteries of Gold and Immortality. Cambridge University Press. Needham, Joseph. 1980. Science and Civilisation in China: Volume 5, Chemistry and Chemical Technology; Part 4, Spagyrical Discovery and Invention. Cambridge University Press. Penny, Benjamin. 2007 “Magu 麻姑,” in The Encyclopedia of Taoism, Fabrizio Pregadio, ed., Routledge, 731-732. Wilhelm, Hellmut. 1944. [Review of] “Wolfram Eberhard: Untersuchungen über den Aufbau der chinesischen Kultur II. Teil 2: Die Lokalkulturen des Südens und Ostens,” Monumenta Serica 9:209-230.